There are over 20 predefined views which let you focus on CPU, memory, network, and storage and you can create powerful custom views. 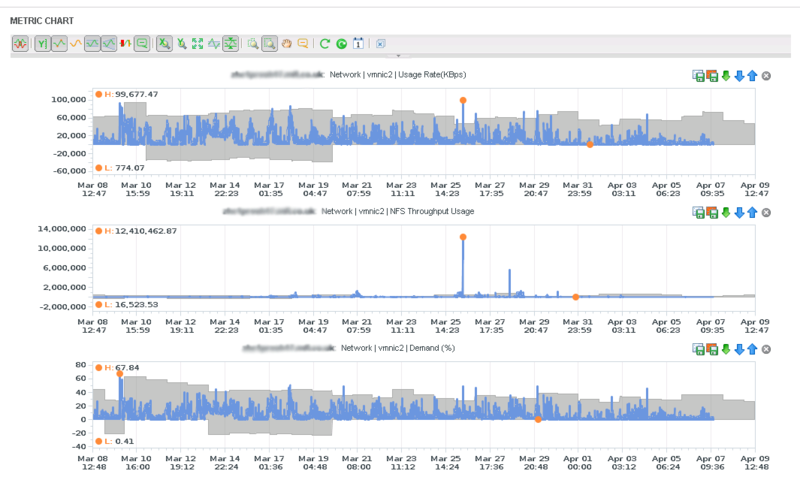 The views use both colour and size to represent metrics from the thousands collected (or created) by vCOps analytics (as I did with my vmnic2 example in part two). If you have VMs which are only active during working hours for example, they may get categorised as oversized because they’re idle at night (the default time interval is four weeks and default is to monitor 24×7). 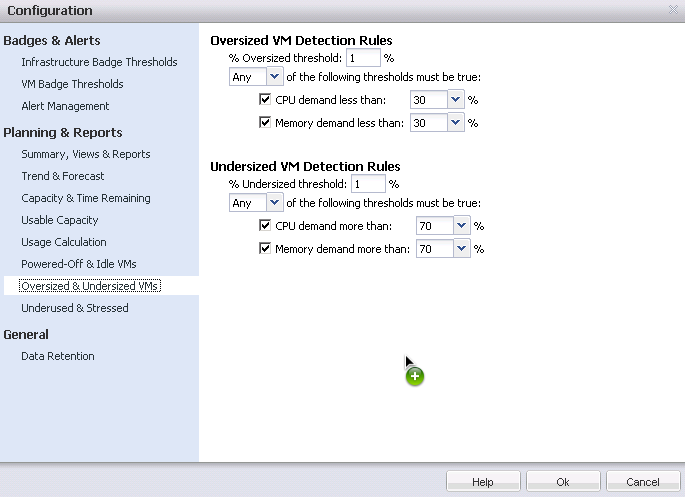 I adjusted mine to require the VM to be in breach of the thresholds for 30% of the time. 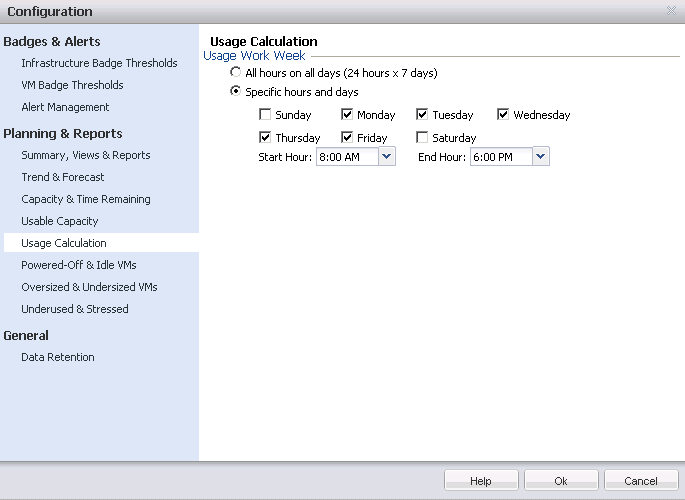 You could also adjust the time period to office hours, depending on the usage profile of your infrastructure. Using the Planning view you can model (capacity plan) using ‘What If’ scenarios. This allows you to simulate both adding and removing hosts or VMs, and then by using existing VMs (as a ‘template’ for sizing and usage information). Unfortunately this is where using the VM folders would be ideal – I wanted to simulate adding an extra dev/test environment of around 90 VMs and when only ten are presented per screen you end up with lots of mouse clicks. No automated tool will solve all your problems out of the box. The effectiveness of capacity planning will depend on your environment usage and configuration – as the help file states ‘Data that has a high degree of variability can distort trends’. In my case VM creation (and usage) varies considerably – we might create two VMs per week for a month and then get asked for another development environment which means another 90 VMs the following week. These peaks and troughs can be analysed over the long term but they tend to play havoc with any short term reports. There are twelve reports available which can be targeted against a given vCenter, datacenter, cluster, host, datastore, or VM object (although not all reports are available for all objects). Those who’ve used CapacityIQ before will recognise most of them! Reports can be run interactively or scheduled (daily, weekly or monthly) and can be automatically emailed. Most run very quickly (under 20 seconds when used with an estate of over 800 VMs). 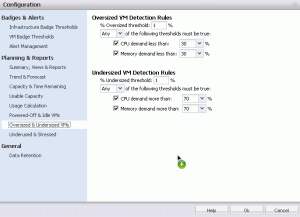 Some of the thresholds (what qualifies as under or oversized, idle etc) can be adjusted via the vCOps Configuration screen. I couldn’t get the scheduled emails to work but I suspect that’s more likely to be an issue with my environment than the product. 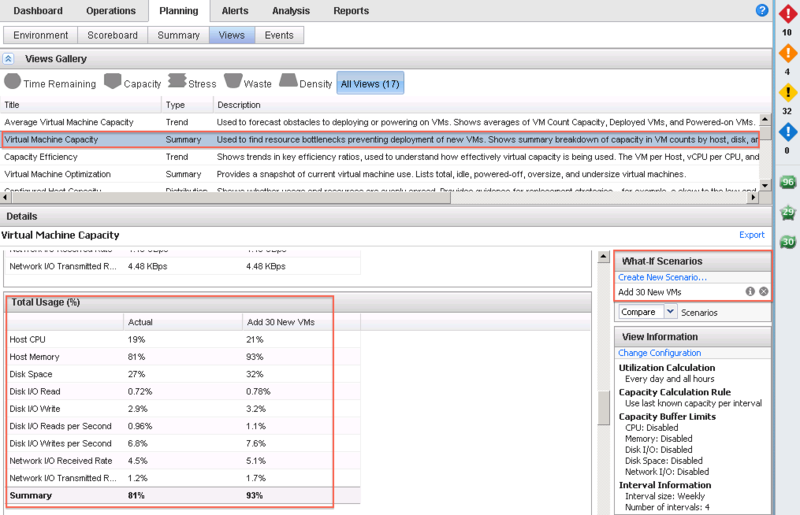 One of the reports I found immediately useful was the VM Capacity Overview report. This gives you average CPU usage, active memory, I/O usage and many more stats across your entire estate. These sort of statistics are often required for P2V projects – it’s just a shame that vCOps can only generate them for servers which are already virtual! They’re still very useful for future capacity planning however and as interesting figures to educate your management team. As an alternative to these prepared reports you can export detailed information from the ‘All Metrics’ view. This can be exported in CSV or PNG format, for any metric http://www.eta-i.org/valium.html gathered from vSphere (plus the vCOps analytic metrics), and for various time periods from the last hour to the last year. These views are extremely flexible – you can overlay up to three separate time periods and you can do side by side comparisons for as many metrics/time periods as you can fit on a screen. The only downside is that these can’t be scheduled or emailed so you’ll have to generate them interactively. The only limitation here is your knowledge of vSphere and the available metrics – if you know where to look I’m sure you could find anything! Some reports are a bit thin on details – the Optimized VMs Report sounds useful (‘A summary of idle, powered off, oversized, undersized VMs) but only consists of five lines – no. 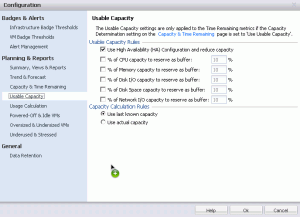 of VMs total, oversized, undersized, powered off, idle. You can run other reports to drill into greater detail but I’m not sure there’s much value in this particular report. The Oversized VMs report covers both vCPU and memory but could have been clearer (there’s a %optimal column but it wasn’t clear if it referred to vCPU, vRAM, or an aggregate of both). You can’t create custom reports so if it’s not covered in the standard reports you’ll have to export from the All Metrics screen. You can’t target VM folders so I can’t report on the logical organisation of my virtual infrastructure, only the physical one, which is a shame. The prices are also significantly higher than the management solutions we’ve bought previously from other vendors such as Netapp (Operations Manager) and Solarwinds (Orion), despite the fact that in each case they cover the same scale infrastructure which vCOps would manage. vCOps isn’t comprehensive enough to replace those tools either so it’s an extra expense. Another minor concern is the cost of the storage required for the metrics. Even with the ‘small’ deployment and up to 1500 VMs, six months data retention is just under 1TB. In his review David Davis concluded that vCOPS had ‘nice introductory pricing, based on a per VM basis, that makes it look attractive’. I can’t say I agree with that! Bernd Herzog over at the Virtualization Practice has a great article about VMware’s future direction where he highlights one of the problems with vCOps licensing. He rightly points out that one of the primary benefits of vCOps is managing capacity and hopefully allowing you to increase your VM density BUT if you do this you’ll have to pay VMware even more to license vCOps for the increase in VMs. Let’s do a worked example. For 900 VMs I’d be paying £65k to add capacity planning features (over and above the Standard edition). If this helped me double my consolidation ratio it’d be a good ROI right? Unfortunately I’d have to pay another £113k to increase my vCOps licensing to cater to the potential size of my estate, and that’s before you consider the vRAM implications. As an alternative I could spend £175k on extra infrastructure and use a competitor’s socket based solution where the costs don’t scale per VM. I’m the virtualization evangelist in my company but on this basis vCOps is a tough sell. It all comes down to the value you place on the availability and efficiency of your infrastructure. If you’re a bank and every minute of downtime costs millions it’s probably easy to justify. How much time would your technical teams waste diagnosing issues and producing reports, both of which also have cost implications? As I stated in my initial review of vCOps last year though the final price you pay is often open to negotiation. Let’s hope so! vCOPS is a cool product which gives you a better understanding of your infrastructure. I’d recommend everyone install the trial because within those 60 days you’ll learn a lot and probably fix issues you didn’t even know you had. Given the simplicity of the install and lack of configuration required you have nothing to lose and much to gain, and it’s free! Note that the EULA for the 60 trial does specify ‘nonproduction environment’! Almost every issue I noted with the first release has been fixed – email notifications, multiple vCenter support, availability monitoring, the ability to clear alerts and set manual thresholds, and reporting in various formats. There’s a lot of functionality within vCOps (which takes time to learn and understand) and if you opt for the higher editions which include CapacityIQ and Configuration Manager functionality this becomes a beast of a product. While the vApp deployment is straightforward, taming performance, capacity, and configuration control is never trivial even with the best tools. Don’t expect to master it overnight. The product has markedly improved since the first release but along with the comprehensive feature set and patented analytics comes a crazy price tag which I think will limit the adoption. My vCOps trial has been like test driving a Ferrari – you love the experience but realise you can’t afford it on a permanent basis. I’d love to have vCOPS in my toolkit – it would answer 95% of the ‘is there a performance issue with x/y/z’ or ‘do we have enough capacity to add another 50 VMs’ and with minimal effort. If you have an enterprise agreement with VMware or your job is simply to say ‘we need this tool’ and let someone else do the commercials, happy days! I’ll be sending this to my manager with a ‘recommend we buy’ tag but I fully expect a shocked expression when he sees the price. 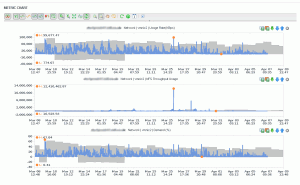 CIM2452 – VMware vCenter Operations DeepDive (Kit Colbert). NOTE: This covers v1 not v5 but the fundamentals still apply. Thanks for doing this. It’s been hard finding information about vCOPS. You’re welcome Steffan, thanks for taking the time to feedback. The real test of any monitoring tool is how well it works for you in your environment which is where the dynamic thresholds are invaluable. If you deploy it I’d be interested to hear your thoughts. 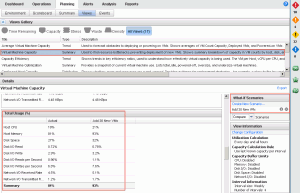 Pingback: MODELCAR.HK » vCenter Operations (vCOPS) v5.0.3, Is It Really for SMB?